Susan Heim on Writing: Through the Valley Love Endures Book Tour: Exclusive Excerpt! Through the Valley Love Endures Book Tour: Exclusive Excerpt! 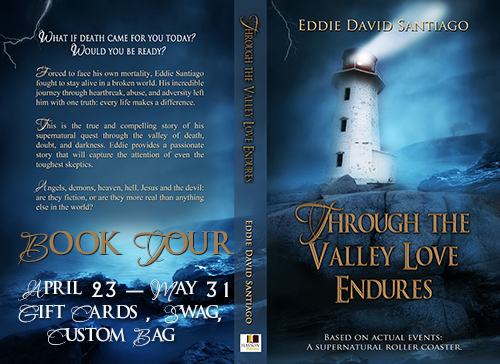 Susan Heim on Writing is pleased to be a stop on the book tour for the book, Through the Valley Love Endures, by Eddie David Santiago. What if death came for you today? Would you be ready? Forced to face his own mortality, Eddie Santiago fought to stay alive in a broken world. His incredible journey through heartbreak, abuse, and adversity left him with one truth: every life makes a difference. This is the true and compelling story of his supernatural quest through the valley of death, doubt, and darkness. Eddie provides a passionate story that will capture the attention of even the toughest skeptics. Angels, demons, heaven, hell, Jesus and the devil: Are they fiction, or are they more real than anything else in the world? With hesitation, Reba held out her hands. Enter Eddie's giveaway HERE for gift cards from Amazon and Starbucks, plus some cool swag! I can’t thank you enough for your support. I greatly value your expertise. Thank you so much for hosting.